(CNN) -- The lawyer for Marion "Suge" Knight insists the rap music mogul did not point a gun at a man Wednesday night in the Los Angeles area. "He's innocent, 100 percent," Marc Brumer told CNN in a phone interview. 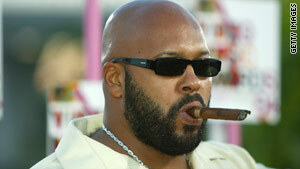 "Suge Knight is a businessman. He is not a person who would carry a gun or flash a gun at anybody. That's not Suge Knight." Knight, 45, was charged with assault with a deadly weapon involving a firearm and with driving under a suspended license, the Los Angeles Police said. According to investigators, an unidentified man reported that Knight aimed a weapon at him. Knight, who co-founded Death Row Records, was later found driving a Cadillac Escalade in the city of Gardena, in the greater Los Angeles area, police said. He was arrested there without incident just after midnight, authorities said. Knight was released after posting $60,000 bail, his attorney said. Brumer said Knight was driving in the area because he was meeting with a young music artist. Knight would be cleared of the charges against him, the attorney said. "There was never a gun found," Brumer said. "He was very cooperative, answered all the questions police had, and we just feel that he shouldn't have been arrested." Brumer suggested that the man who said Knight pointed a gun at him should be investigated for making a false allegation. "There are a lot of people that hate (Knight) and are jealous of what he has obtained in his life," Brumer said. In addition, he was with Tupac Shakur when the rapper was shot to death in Las Vegas in 1996. The slaying has not been solved. Knight has paid his debt to society and is exploring new business ventures for the future, his lawyer said. "He's working with new artists, starting a record label, looking into sports management companies," Brumer said. A reality show on his life is also a possibility, the attorney added. "He's really an icon in the music industry, and really looked up to in the African-American community," he said. "He's a bright man. He wouldn't carry a gun on him. That's not him."